The answers were AWESOME! I loved how we had a good mix of parent-to-parent and SLP-to-parent suggestions. 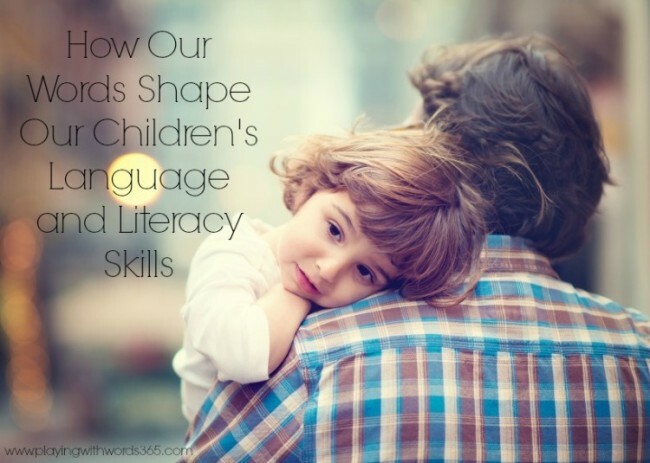 The conversation over there inspired me to share a little research on how our words shape our children’s speech, language and literacy skills and share the most important basic thing you can do to help your child’s language development from the day he is born. Numerous studies have indicated that a strong language base is key to a child’s later academic success. In their groundbreaking longitudinal study, researchers Betty Hart and Todd Risley (1995) followed 42 children from varying socioeconomic backgrounds to study the effects of adult to child talking on a child’s later speech, language, and literacy development. The researchers recorded one full hour of parent-child interactions every month in the home beginning in infancy until their third birthday, and followed up when the children were between 9 and 10. They found the quantity of words spoken to a child in the first three years of life were strongly associated with a child’s language skills, vocabulary size and IQ later in life. New research coming out of Stanford confirms Hart & Risley’s findings. Anne Fernald’s research is finding that language discrepancies can be evident as early as 18 months between groups of children exposed to more vs. less language. Her research also indicates it’s the words spoken directly to a child that are responsible for vocabulary growth, not words the child passively hears like while watching television or by being around adults conversing to one another. Hart and Risley had another interesting finding: Those children exposed to more positive feedback and statements in relation to negative feedback had the highest language skills at age three and beyond. Rowe wasn’t the only one to discover the importance of conversation. In another study conducted by the National Institutes for Children’s Health and Human Development, researchers followed 1200 children in several cities in the US from birth and found that children who were engaged more in conversation by their caregivers or teachers knew more colors, letters and shapes at age three than children who were engaged less in conversation in those first few years of life. Unfortunately, another finding from these studies mentioned above was that children of lower socio economic status (SES) tended to hear significantly less words than those in higher SES homes. In fact, Hart and Risley found children of low SES heard 30 million less words by age 3 than children in high SES. As mentioned, the the newest research by Stanford confirms this, showing that this gap can be evident as early as 18 months. Amazingly, brain studies can actually see the difference in the brains of these two groups of children, with the children exposed to more language having larger language areas of the brain than those exposed to significantly less language. 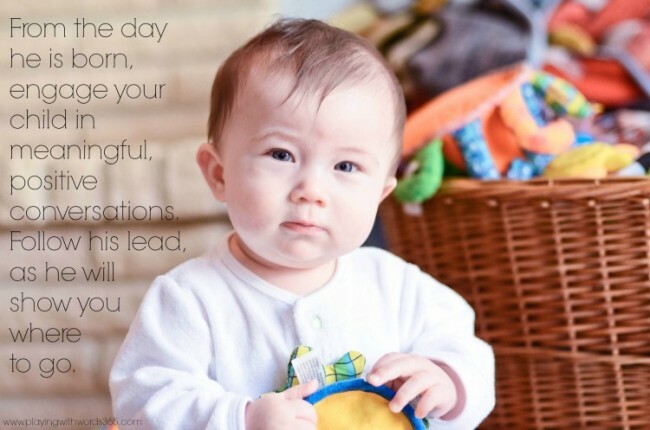 Further evidence that the quantity and quality of our interactions with our infants and toddlers is so very important! There is hope: With proper interventions, there is evidence that parent education and training can help overcome the 30 million word gap. I recently posted about the fact that you can do EVERYTHING “right” and yet, still have a child with speech and language delays. I am living proof of this, as I am a speech pathologist, an expert in communication, and yet I have a son with a mild speech delay. Though talking to your child is by FAR the BEST thing you can do for your child from birth, there are many other variables at hand and I’ll be talking more about this is an upcoming post. Sometimes, talking is NOT enough. But, it IS so very important! Hart, B. & Risley, T.R. (1995). Meaningful differences in the everyday experiences of young American children. Baltimore: Paul H. Brookes Publishing Co.
Hirsh-Pasek, K. & Golinkoff, R. (2003). Einstein never used flashcards: How our children really learn- and why they need to play more and memorize less. Emmaus, PA: Rodale Publishers. Rowe, M. (2012). A Longitudinal Investigation of the Role of Quantity and Quality of Child-Directed Speech in Vocabulary Development. Child Development: 83(5), 1762-1774. Thank you so much for your informational posts. I send a link to your site to teachers in my building often to share your great information. Keep up the good work! Hi Tara! You are so very welcome. I am so happy to hear my posts are helpful to others. Thank you so much for sharing! Thanks for helping me and all out there who needs guidance. You are so welcome, I am thrilled to be able to help! Katie, what a fabulous post! I can’t wait to share the link with my readers tomorrow. So many great points. I kept saying, “yes, yes, yes” as I was reading. Thanks for providing the statistics but making it easy to understand for parents. Jodie, I am so happy to hear this was easy to understand! That was my goal. I know as a parent, this is so important. Thanks for sharing and thanks for your insight!